Any death ray worth its name will be sufficiently intense that anyone looking directly into the beam will be instantly blinded (if not killed - it is, after all, a death ray). There are, however, other vision hazards. The cornea, lens, and vitrous humor of the eye are transparent to wavelengths between roughly 0.35×10-6 and 1.4×10-6 meters. If a small fraction of a death ray beam in this wavelength range is specularly reflected off a smooth surface, anyone looking at that surface will focus the reflected light into a tiny spot on their retina. This can heat the retina up enough to cause a third degree burn, leading to a spot of permanent blindness. Very powerful lasers (such as just about any death ray) can still be hazardous after mutliple specular reflections - the fraction of the beam that reflects off the target might bounce off a shiny hubcap, reflect off a window, and then reflect off the shiny paint job of a passing car to blind a bystander. Note that part of the wavelength range of eye-hazardous light is invisible. You might never see the beam that blinds you. However, a small amount of frequency doubling occurs in the eye's vitrious humor. 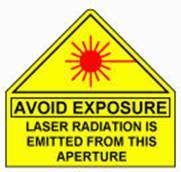 Those unfortunate people who have been blinded by the 1.06×10-6 meter wavelength light of a Nd:YAG laser (which is in the near infrared, and thus invisible) have reported the last thing they saw was a green flash, as a small part of the intense near infrared light is frequency doubled to 0.53×10-6 meter wavelength visible light. 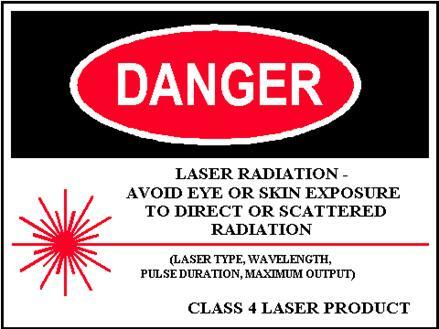 The incandescent plasma produced by an incident death ray beam can also be bright enough to cause eye damage. Just like looking at the sun can cause retinal burns, looking at the plasma flash can injure the eye. However, because the plasma can be much hotter than the sun, the damage can occur faster. In addition, hot plasma emits dangerous amounts of ultraviolet light, which can burn the cornea and cause catracts. This phenomena is called arc eye, and is a hazard commonly encountered among welders and people who deal with high voltage electrical systems. Similarly, light from the beam that is diffusely scattered from the target, if it is of the right wavelength, can be bright enough to cause retinal burns. While specularly scattered beams can pose a hazard at long distances but only in very specific directions, the incandescent plasma and diffusely scattered light will affect anyone looking at the point of incidence of the beam that is close enough. It is interesting to note that we all have a blind spot where our optic nerve connects to our retina. Our brain filters out the blind spot and fills it in with information from the surrounding visual field. Likewise, small laser-created blind spots may never be noticed because the brain pulls the same trick with the injured part of the retina. An odd result is that someone might lose a significant part of their visual acuity and never notice. Even if a flash does not have sufficient intensity to cause permanent injury, it can lead to other vision problems. First or second degree retinal burns may heal with time, but will lead to blindness while the healing occurs. Very intense visible light can lead to bleaching of the photopigments in our retinas that detect light. This disables the photopigments until they recover, which may take as long as a few hours to as short as a few seconds, depending on the intensity of the flash. Ultraviolet light that can pass through the eye can cause sunburn to the retina, again causing blindness until the retina recovers. In many cases, eye damage from indirect exposure to the beam can be avoided by wearing protective glasses that filter out the wavelength of the laser being used. If you want to have a death ray that can be used without worrying about blinding people without eye protection, you can use wavelengths of 1.5×10-6 meters or longer or 0.34×10-6 meters or shorter.